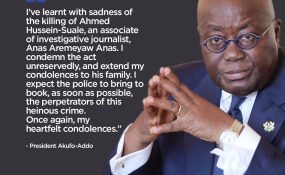 Ghanaian President Nana Akufo-Addo posted on Twitter that he expected the police to swiftly bring the perpetrators to justice. Police have questioned Ghanaian MP Kennedy Agyapong over Wednesday's murder of investigative journalist Ahmed Hussein-Suale, a member of Tiger Eye Private Investigations led by renowned journalist Anas Aremeyaw Anas. Agyapong previously appeared on television and made threats against Hussein-Suale following an investigation into corruption in Ghana's football leagues. He was questioned on Thursday, David Eklu, a spokesman for Ghana's police, told RFI. He was not arrested, but questioned as part of a preliminary investigation. The case has been taken up by the homicide unit and they have requested the original footage from the television station featuring a segment showing Agyapong making threats against Hussein-Suale, according to Eklu. He added that they did not have any suspects "at this stage" and an autopsy was yet to be conducted. Hussein-Suale was killed on Wednesday night in the Madina suburb of Accra, reportedly by two gunmen on a motorbike who shot him three times. He suffered two gunshot wounds to the chest and one to the neck, dying on the spot. In Agyapong's threats, he described Hussein-Suale as "very dangerous", encouraging viewers to "beat him" and reassuring them that "whatever happens, I'll pay". He identified Hussein-Suala as living in the Madina area. Kissi Agyebeng, a lawyer for Tiger Eye Private Investigations, told RFI that the MP's threats were "criminal" and he needed to face the consequences. "You cannot go on television and offer money for someone to be beaten up," said lawyer Agyebeng. "We hope whoever did this is brought to book and made to face the law," he added. Hussein-Suale had worked with Anas Aremeyaw Anas on an investigation into cash gifts in Ghana's football leagues. The undercover report published last year led to a lifetime ban for the former head of Ghana's Football Association. He also worked on an investigation into killings in Malawi and the use of body parts in ritual magic. Anas, who often appears with a beaded mask to disguise his face, said it was "sad news", in a video posted on his Twitter feed. "We shall not be silenced in our fight against corruption. Journalism is not a crime," said Anas, who has frequently stirred controversy with his hard-hitting investigations. In an interview in 2015, Anas told RFI that it was "very uncomfortable" to be living with the thought that the "bad guys are always on your heels and they want to expose you". Ghana's President Nana Afuko-Addo condemned the killing of Hussein-Suale, saying he was counting on the authorities to find the killers. "I expect the police to bring to book, as soon as possible, the perpetrators of this heinous crime," he said in a tweet. Press freedom groups said the Ghanaian authorities had to take threats against journalists seriously. "Ghana's government must prove itself willing to hold accountable those who attack the press," said Angela Quintal, Africa programme coordinator for the Committee to Protect Journalists.